I really do think part of this “speaking” process results from the knowledge one accumulates about the items in one’s collection and how they interrelate. Another part of the process is uncovering new information and seeing how it fits into the whole or within one of its parts. Discoveries often come into view because of an expanded and more sophisticated information base. In depth understanding, coupled with an acute sensitivity to an object’s aesthetic or historic qualities, fosters more opportunity for the creation of an inner dialogue with an object. In my own case, this can be exemplified through my acquisition of two Silvia Rennie bindings on Mosher books, expensive bindings which I otherwise would not have thought of buying without that requisite dialogue and acceptance. 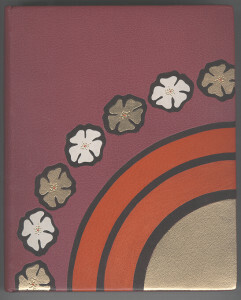 Modern binding on Baudelaire’s “Poems in Prose” (1909) by contemporary artist Silvia Rennie. In September 2001 I was contacted by a fellow member of the ABAA, the delightful Susan Heller of Pages for Sages Books in Cleveland, Ohio. She had read one of my periodic pleas for Mosher book quotes, and contacted me about a little Baudelaire piece she had, a copy of Mosher’s Poems in Prose bound by Silvia Rennie. (Strangely enough, she reported that she had this binding listed on her computer for some time, but somehow it never uploaded as a book-for-sale on the Internet books-for-sale databases. Was it waiting for me?) I was somewhat intrigued due to my former acquaintance with Rennie during my research for the Mosher bibliography (1998) and especially because I had a listing from a 1990 catalogue in which this little book appeared. The binder herself indicated that “this binding is lost!” in a little handwritten note she sent to me with a photocopy of the binding’s picture and entry in the “A.R.A. 2nd Forum International de la Reliure d’Art” catalogue. Susan Heller wanted $1,000 for the book, and since I only had one modern binding on a Mosher book (that being one of just about the same size done by Silvia Rennie’s mentor, the Swiss master binder Hugo Peller), I decided that that the two would make a nice student/teacher pair. This, coupled with the fact that the book at Keisogloff was 2½ times the cost, led to a delightful and very friendly exchange between Sue Heller and yours truly, in which she indicated she purchased the binding in 1996 from a local collector who, in turn, purchased it from Paul Csank of Keisogloff Books (hmmm, now where had I heard that name before?). A mutually satisfactory deal was struck, the Baudelaire was sent on approval, and I was totally delighted once I got to fully inspect it. The Baudelaire really is a darling. The feel, the smell, the artistry, in short the book’s whole aesthetic, was very pleasing. Adding to that what else I knew about it, my decision to keep it was clinched. The book had spoken to me by virtue of its objective appearance, and by the little bit of history I was able to ascertain, not to mention the direct communication with the binder who remembers it as being done under the influence of Tini Miura’s Japanese stylism. Yet more than that, it began a “conversational” process whereby I’d acquire yet another treasure from the hands of Silvia Rennie. As I said previously, that copy of Rossetti’s Poems landed on the Internet back in 1998. For three years I didn’t purchase it although I did think about it off and on. But my prior research into Rennie’s bindings, Sue Heller’s offering, personal comments from the binder, other comments from a fellow Mosher collector, and a coincidental purchase of a Rennie exhibition catalogue, all conspired and almost demanded that the challenge be accepted. 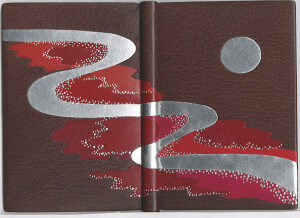 After purchasing the Baudelaire, I contacted a couple of my book collecting colleagues to share an image of the binding. One wrote back on October 12: “Given the size of the book itself it is quite a piece of work. I have noticed for quite some time another Rennie book on ABE, I don’t recall the name of the work off hand [Rossetti’s Poems], but given the extraordinary cost they were asking for, it was far outside of my range” and the same correspondent following up the next day with “I can in part see where the price for the Rennie on ABE is coming from, given it is a Rossetti Quarto which makes the binding all the larger and no doubt with it’s accompanying case all the more complex. Still it is a significant amount of money.” Indeed, it was and still is a significant amount of money, and I continued to stall in any further attempt to purchase it, but other things intervened to cause me to think that much harder about it. With the Baudelaire in hand, I again contacted Silvia Rennie. She was very pleased to know it was located, wanted to know how I found out about it, whether I liked it, and so on. She also mentioned that the original text block was acquired when she purchased a number of Mosher books in 1984 whilst on a teaching tour with Hugo Peller. She recalled that it was in Portland, Oregon that Don Guyot (a fellow binder) directed her to a book dealer who had them at a time when she was looking for “nice but not exorbitant books that I could bind on spec” and the Rossetti was among them. What a remarkable statement that was! The name Don Guyot rang a bell. Rennie’s comments were simply providential, for following my purchase of the Baudelaire, I had ordered a copy of “Silvia Rennie Designer Bindings,” an exhibition catalogue from the September 1985 show of her bindings at Kroch’s & Brentano’s in Chicago. Unknown to me when I ordered the catalogue, two pieces of ephemera were loosely laid inside it: one a printed invitation to the exhibition, the other a small double-ruled bookplate stating “From the Bookarts Library of Don A. Guyot Marbler….Bookbinder.” This is the same Don Guyot that introduced Silvia Rennie to that little stash of Mosher imprints which would become the fodder for her creative flames. The catalogue displays her binding on Rossetti’s Poems. Furthermore, the copy of Don Guyot’s invitation to the show opens up to a summary of Rennie’s bookbinding career along with a picture of “Silvia Rennie at work on one of her bindings.” And what binding might that be? None other than the cover of Rossetti’s Poems with the binder tooling one of its concentric rings! By Rennie’s own admission, it’s rare indeed to have any picture of her at work, much less to have one showing the very book I was considering for purchase! Rennie noted that the picture was taken by a “chap from the Capital Times in Madison, WI, as I remember, it was the one and only acceptable one…” So it’s even more remarkable that this picture should have survived. Well, …. are you beginning to get an inkling as to what I mean about the book “speaking to me”? I spoke with the owner [Paul Csank] about this volume back in 1998 when I ordered three Charles Bubb/Clerk’s Press books from your firm. I have finally decided to make a gentlemanly offer… on the Silvia Rennie book which you’ve had there at Peter Keisogloff Rare Books since April 1991 when Silvia gave a workshop at your premises. I’m not particularly fond of the binding, but still wouldn’t mind another Silvia Rennie in the Mosher collection, yet won’t go beyond that amount for the book. If this is totally unagreeable to you, there is absolutely no problem and you need not even take the trouble to respond, and I sincerely hope I have not in any way offended. Modern binding on D. G. Rossetti’s “Poems” (1902) by contemporary artist Silvia Rennie. The offer was cordially received yet rejected, but the terms they did set out were favorable in that they’d ship the book and give me ten days to make up my mind. As far as I was concerned, by November 15 enough had transpired of my inner dialogue to warrant the book to be sent “on approval.” Again, once seeing it in person, it didn’t take long for it to “communicate” all that I’ve learned about it: Rennie’s comments, the significance of the design, its history, the book’s provenance, the exhibition notice with picture, and now the feel, the excitement in seeing the very unusual sparkling gold and silver designed gauffering atop the book’s dark graphite page edges, the gold and silver endpapers, Silvia Rennie’s hand signature as well as her binder’s stamp, and so on and so forth. The book was “speaking to me” and I was listening. Upon hearing the news of my purchase, the same Canadian colleague who noticed that book on ABE offered his “congratulations on the Rennie purchase. That must make quite a number of Quarto Series editions you have [in fine bindings]. I don’t blame you for breaking down and getting it, if for no other reason than the story which you will be able to add to the volume which is your collection.” The story has now been written, told to the Delaware Bibliophiles and now retold to readers at the ABAA site, but first “spoken to me” by the quarto edition of Rossetti’s Poems in Rennie binding. Had it not “communicated” its worth (or God forbid, had it been sold before the dialogue was over), I would have forever held my peace. Thank heavens it spoke up! Note: The above was adapted and revised from two articles appearing in the September 2002 issue of the Delaware Bibliophiles’ newsletter, Endpapers, used here with the kind permission of the president and editor of that organization and newsletter, Gordon Pfeiffer.